If you are a regular reader of this blog, you know that I frequently lament mysteries, thrillers, or suspense novels that I figure out ahead of time. It’s not that I am so smart, but that many of the plots are formulaic in nature — therefore it is easy to come to a conclusion before it is revealed in the narrative. Wilde Lake is not easy to figure out. Laura Lippman has one plot twist after another, and before you know it you’ve been reading and the novel took a turn you didn’t expect. It was easy to give this book a four-heart rating. Wilde Lake weaves back and forth between two different time periods and does this effortlessly. One part of the story is Lu Brant’s personal account of her childhood in Columbia (planned as an inclusive utopian community), where she and her brother AJ grew up and attended Wilde Lake High School. The story opens with her memories of AJ’s attendance at a graduation party which was marred by a suspicious death. The other half of the story is contemporary and recounts Lu’s life as a single parent and prosecutor. Lu’s first case is the murder of a local woman, Mary McNally, who didn’t report to work after a week-long vacation. It is quickly determined that the murderer is Rudy Drysdale, a local misfit and former classmate of Lu’s brother AJ. Wilde Lake is an engrossing read — hard to put down. Just when you think you have it all figured out, Lippman throws in another plot twist. The end wraps up nicely though, and the book keeps you guessing. My only fault with the novel is that some of the story just doesn’t seem entirely plausible, but I wouldn’t let that get in the way of an entertaining read. Book Details: Published by William Morrow (May 3, 2016), 368 Pages, ISBN: 978-0062083456. 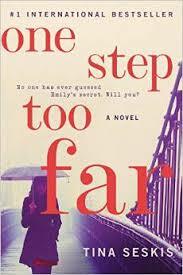 The first thing you see when you pick up One Step Too Far is that is a #1 International Bestseller. This is an immediate hook for me, as I’ve long held that European writers know how to tell a story better than American writers. American writers simply put too much action in the book for me. It just seems as if they’re already writing the screenplay, instead of telling me a good story. Tina Seskis’ novel did not disappoint me! Emily Coleman has a happy marriage, a beautiful family, and a beautiful home. She’s a former attorney who stays at home with her small son. So what makes her get up one morning and start all over as Cat Brown? Cat quickly makes a new friend, Angel, and begins working as a receptionist at a hip advertising agency in London. Cat’s new life could not be more different than her old one. Angel teaches her how to survive and thrive on the London scene and soon Cat has risen through the ranks of the advertising agency. Inevitably, Emily’s old life and her new life as Cat intersect. You will have to read the book to find out what happens next! This book was far better than even I had imagined. While none of the characters are particularly likeable, by the time you get to the end, you can at least understand them. In some ways this book reminds me of The Goldfinch, by Donna Tartt. The characters engage in some of the same destructive behavior and you wouldn’t want them for a friend or a family member, but you can understand why they do what they do. This book was hard to put down. This was the first book I’ve read since finishing The Goldfinch by Donna Tarte. I can honestly say I prefer After I’m Gone. I know you’re thinking “How can you compare the two books?” Well, let’s start with the characters. Theo Decker in The Goldfinch is just not likeable and neither are any of the other characters in the book. On the other hand, After I’m Gone has a few likeable characters beginning with the former police doing the investigating. You can actually sympathize with the characters in Laura Lippman’s book, not so much with the characters in The Goldfinch. The book begins with the flight of Felix Brewer, a family man facing a ten-year prison term for gambling and racketeering. He is helped in his escape by his mistress and her sister. Ten years later to the day, the mistress, Julie also disappears. Eventually Julie’s remains are found, but the investigation into her death becomes a cold case. Twenty-six years after Julie’s disappearance, Roberto “Sandy” Sanchez, a retired Baltimore detective working cold cases for some extra cash, begins investigating her murder. What he discovers is a tangled web stretching over three decades that connects Felix Brewer’s wife, three daughters, and his dead mistress. Somewhere between the secrets and lies connecting past and present, Sandy works to find the truth. 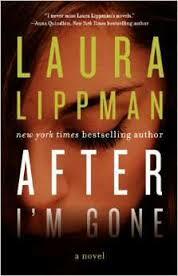 Just like any booklover, I have my favorite authors and Laura Lippman is one of those favorites for me. If you are a Tess Monagham fan, don’t despair, she makes a brief appearance in Afer I’m Gone and I have to say that Laura Lippman handles it beautifully. You definitely need to read this novel. It is a perfect diversion from the everyday and you will grow to care about Bambi and her daughters, they seem so much like some of the people you may know. Book Details: Published by William Morrow (February 11, 2014), 352 pages, ISBN: 0062083392. Agent X is a fast-paced read that is tough to put down. There are no slow spots in this spy thriller! Steve Vail, a Chicago bricklayer arrives in Washington to take Kate Bannon, the FBI’s new assistant director, to an important New year’s Eve function. They never arrive. Kate is summoned to a clandestine meeting where both she and Steve are asked to find out who Calculus is and also where he is. Calculus is a Russian embassy staffer offering to name Americans feeding information to Russian intelligence. Steve and Kate must identify the spies and bring them in before the Russians get to them first. Steve Vail quickly begins to solve the many puzzles that Calculus uses to conceal information. The puzzles are great and Boyd ties the action and the clues together well. The romance between Vail and Bannon is not overdone as is so often the case in thrillers involving male and female protagonists. 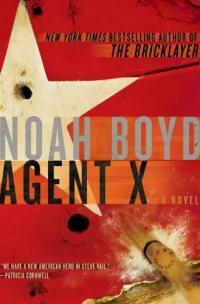 My only complaint is that I figured out who Agent X was before he was revealed in the novel. Boyd just missed a five-star review from The Booklover on this one technicality!